Opportunities to actively be stimulated, learn and connect to like-minded and committed fellow researchers do not abound. The third edition of the EMES-Polanyi Seminar, this year co-organized by the EMPOWER-SE COST Action, has confirmed to be a rare moment of such deep thought, learning and sharing. While Karl Polanyi has not yet reached the position of mainstream economists, his thinking and his work have contributed to the theoretical blueprint of research on social enterprise and social and solidarity economy in the last years. It is crucial for building the next generation of SE scholars. The relevance and the timeliness of his thinking inside and outside the academia make some experts state that the 21st century will be the century of Polanyi. 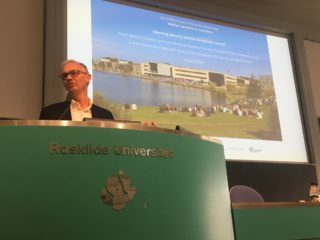 A taste of why this is likely to be the case was offered in Roskilde University and Grennesminde last week. Some of the worldwide Polanyi experts were there and they shared incredible insight with the over 90 people who participated, all of us eager to learn how a Polanyian look could be when contemplating such challenges as transition of the welfare state, sustainability and achieving the UN Sustainability Goals. 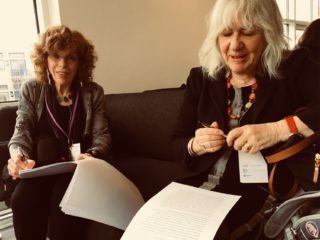 When introducing keynote speaker Margaret Somers, the seminar co-chair, Lars Hulgård, warned us of the fact that her teachings could be scary for all her sound and eye-opening criticism unveils. Indeed, the seminar could not have begun on a better note. 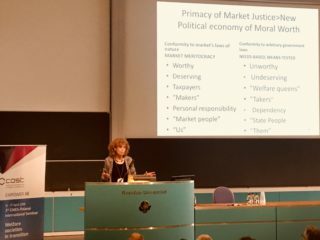 Margaret Somers offered us a painstaking walk through the ways in which social naturalism laid the basis for the discourse around market justice, in the sense of neutrality, to emerge and consolidate. The consolidation of the justice of the market, deprived of any compassion or morality, has brought about a dangerous result: the justification of social exclusion. The response of Polanyi to such barbarianism was to question market fundamentalism as a utopia; a genius twist that led him to state that creating disillusions (such as “market justice”) that conceal the reality of society constitutes in itself a form of violence. “Polanyi” –said Somers– “reversed the idea of utopianism to criticize the natural law of the market.” Her analysis went on with unique statements such as “the road to laissez-faire was paved by political intervention” or that “Polanyi’s project was to bring consciousness back”. When asked about some hopeful initiatives stemming from social movements and citizens, such as the environmentalist movement, Somers stressed that it has far more potential than saving the planet only, as urgent and unavoidable as this may be, given the enormous transformative potential that it carries with it. This would be the case of the environmentalist movement and others, including solidarity-based initiatives and social enterprises, with their seeds of real transformation. The bottom line question, widely debated in the course of the two days that ensued, was whether these experiences coalesce, resisting the commodification of knowledge, so as to be able to push for new public policies that support social and solidarity economy and the myriad of organizations and initiatives it includes. For those of you who did not have a chance to be a part of the audience listening to Somers’ keynote speech, the video from the session will be released soon. In addition, a number of Selected Conference Papers from the Seminar will be published in the summer. For now, you can see some pictures on the Facebook album and the interesting social media activity created around the seminar, mostly on Twitter, searching for the event hashtags #3EMESPolanyi and #EMPOWERSE_COST.